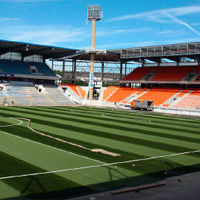 France: Lorient to relocate to a new stadium? Back in 2009 Stade Moustoir had average crowds of some 11,000 and was the 20th in Ligue 1 in terms of attendance. Now Lorient is 10th with over 15,000, but with 83% of seats taken, there's little room for further way upwards. This is why FC Lorient informed about plans to potentially build a new stadium in the public-private partnership, quite common in France. New infrastructure is a must especially in commercial terms, as the club lacks VIP/corporate space at the moment. And with Euro 2016 just around the corner, competition in matchday revenue is stiffer than ever. Speaking to France Football's current issue, club president Loïc Ferry declared a potential relocation to Auray is possible. This may come as a surprise to some, as Auray lies 40km east of Lorient. Whether this is just a way to put pressure on Lorient authorities or a real plan, we are yet to see.